caffè HABITŪ is a lifestyle-driven Italian café and bar that combines the convenience and consistency of a coffee shop chain with the charm and hospitality of a cozy, tasteful eatery. 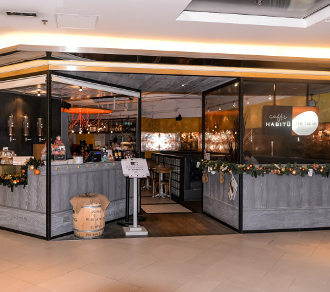 Following sustained acclamation of caffè HABITŪ, the group introduced caffè HABITŪ the table, its casual and more sophisticated gourmet café-restaurant counterpart. The idea is to offer a venue for customers to fully immerse in the caffè HABITŪ experience while soaking in an enchanting bistro environment where they could enjoy simple, comfort dishes. The unveiling of caffè HABITŪ the table brings exciting touches in food and beverages as well as ambience. The chic yet relaxing contemporary interior design highlighted by a charming coffee bar area, with the energetic dining space and its careful accents, underline the group’s commitment in delivering the finest dining experience to guests.